Mr. Mosley’s Eighth Grade Orchestra open the concert with Richard Meyer’s Geometric Dances. The Mrs. DeRose’s High School Concert Orchestra took the stage starting the evening musical theme of Tributes. They played Andrew Dabcynski’s arrangement of An Armed Forces Tribute, Jon Williams The Olympic Spirt, and a Beatles Melody. 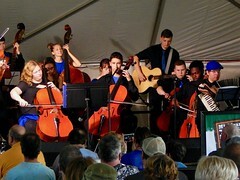 The Mona Shores Fiddlers played two tunes. One original piece Amran nut de Caerlaverock by our own Greg Beaudoin. This piece was first performed by the Fiddlers at 2016 Collage Concert but tonight we got the touching explanation on how Amran nut de Caerlaverock is a tribute to his family. 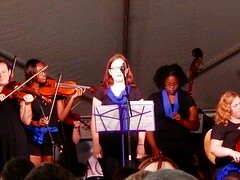 The Fiddlers finished night with a new version of Jackie Tar. The Symphonic Orchestra continued the tribute theme with John Phillip Sousa’s Stars and Stripes Forever and a Tribute To John Williams adapted by Paul Lavender. Tribute To John Williams was accompanied with a video arranged by Mr. Dave Droski and Jacob gravel. The Combined Orchestras played Franz Hayden’s The Finale from Symphony No 45, arranged by Richard Meyer with the musicians turn off their stand lights when leaving the stage as they played leaving only the Seniors at the end. The Senior Strings presented some touching gifts to Mrs. DeRose and performed Jupiter From The Planets by Gustav Holst, arr. Deborah Baker Monday. Some images and sounds of the 2015 Spring Concert. Purchase vouchers through the MSOPA and you pick your own flowers out at Fisher-Pawlowski Greenhouse . Click on the 23rd Annual Spring Flower Sale tab above for more information or to print a order form.